During the crisis at the Fukushima nuclear power reactors following the earthquake and tsunami on March 11, 2011, the Japanese Safety Authority issued ratings for the accident on the International Nuclear Events Scale (INES). Initially, it stated that the incident was a level 4, but it subsequently raised the levels assigned to each reactor, with the majority receiving a level 5. Table 1 indicates the latest ratings issued March 18 by the Japanese authority, where it has parsed the ratings based on accidents at individual reactors. Although the radioactivity is emitted from different reactor buildings, it represents a collective hazard to public health. As such, the accident should be judged comprehensively, not only in component parts. Simply because some aspects of the crisis were not as catastrophic as others does not lessen the overall severity of the accident. ISIS continues to assess that the accident is a level 6. The INES system exists to communicate with the public about the severity and extent of a nuclear event. It is meant to provide a guide, such as the Richter scale for earthquakes, to qualify a nuclear accident. As such, it is important to accurately rate a radiological event in order to afford the public the time and information needed to take necessary precautions. 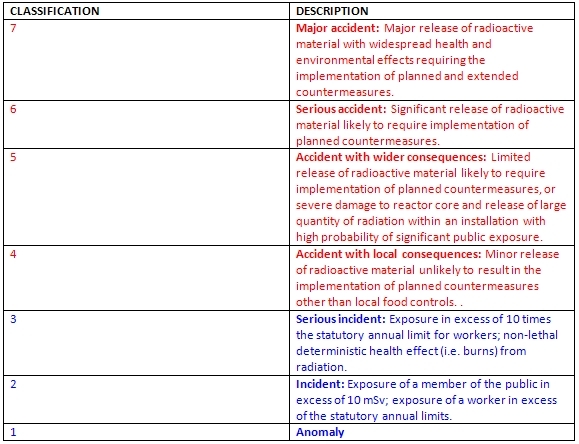 The INES scale rates radiological events on seven levels. Levels 1-3 are termed “incidents,” and levels 4-7 are called “accidents.” Each level in the scale is supposed to represent a tenfold increase in severity. Table 2 indicates the INES scale’s qualifications for each level of incident or accident. For example, in 2005 at Atucha, Argentina, a level 2 incident occurred when a worker exceeded his annual level of exposure. Three Mile Island experienced a level 5 accident when the reactor core lost coolant and partially melted down. The Chernobyl disaster is rated a level 7 accident, as the explosion in the reactor had widespread environmental and heath implications. In a level 6 accident, according to the INES scale, “it is very likely that protective action such as sheltering and evacuation will be judged necessary to prevent or limit health effects on members of the public.” Throughout the disaster, Japan has continued to expand its zone of evacuations. The Japanese authority’s rating of level 5 indicates that in their opinion, the release of radiation is limited, and only some planned countermeasures need to be implemented. However, unlike the accident at Three Mile Island, the Fukushima Daiichi situation involves three reactors as well as on-site spent fuel ponds with exposed fuel rods, instead of only one reactor core. The amount of radioactivity released, particularly in the first week after the accident, was significant. It was perhaps even worse than initially assumed because much of the radiation released in the days immediately following the tsunami may not have been detected because of inoperative or limited radiation monitoring equipment at the site. Additionally, much radiation has been released into water on-site and into the sea. This contamination will likely have significant environmental implications and require the implementation of additional countermeasures. It is imperative that the accident at Fukushima is characterized appropriately, as the INES scale exists to inform and alert the public about the risks it faces as a result of a radiological disaster. Based on the venting of radioactively contaminated steam from the reactors, the hydrogen explosions and fires at the reactors, the possible burning of spent fuel in unit 4’s pond, the amount of radiation released, the extent of the radiological contamination on land and in the sea, and the level of countermeasures implemented, the situation at Fukushima Daiichi should be characterized a level 6 accident.